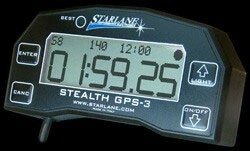 BY NOW AVAILABLE THE NEW GENERATION OF STEALTH GPS LAPTIMERS. The new STEALTH GPS-3 laptimer is the result of the continuous research and development by Starlane's staff on smart systems for motorsports and racing. -STEALTH GPS-3 allows the data download directly to your USB pendrive, with this solution you can enjoy it without bringing your computer on the track area. -Stealth GPS-3 has the possibility to be connected to the optional CAN BUS expansion module that allows the acquisition from external sensors (ex. throttle, gear, RPM, etc. ), making your laptimer a data acquisition system. -With STEALTH GPS-3 you will never face memory full issues because,in order to allow a continuous usage, it manages the available space by erasing automatically the oldest sessions when the memory is almost full. -SAFD (Starlane Automatic Finish line Detection) FUNCTION FOR THE AUTOMATIC POSITIONING OF THE FINISH LINE ON ANY TRACK WITHOUT INTERVENTION BY THE USER. -You can compare your performance and trajectories with other users on WWW.STARDROME.COM, the Virtual Racing Community created by Starlane to allow the users understand how to improve their fast driving skills.